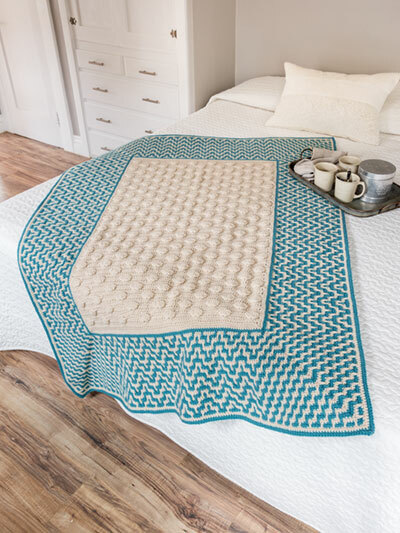 This afghan was designed to evoke little wavelets receding across the sand and back to the sea. The sand-colored center alternates single and double crochet rows with seashells for texture. Crochet with Plymouth Yarn Encore Worsted yarn: 11 skeins sand, 6 skeins vacation blues. Pattern uses a U.S. size H/8/5mm hook. Finished size is 48"W x 61"L. Design by Margret Willson for Annie's Signature Designs. I have read this pattern and it looks interesting and maybe a little challenging. I'm sure it will be beautiful when finished.